Okay, okay, what does all that have to do with subways, etiquette, and chivalry you say? First of all, see (disclaimers section), because I’m long-winded and I digress/segue a lot. Anywho, I am a lady- most of the time (I’m talking figuratively- not literally…because I’m a real girl. Pinocchio I feel your pain). I do enjoy being treated as a lady. I think that I can be a lady and accept gestures and whatnot and still maintain equal individual status- make sense? Gents be good to me and proper, but do not think that you are smarter or better because you have twigs and berries, m’kay? Danke. So, to the topic at hand: chivalry is dead when it comes to commuting. How many times have you seen men knocking down women of all ages and sizes to squeeze into a seat, jockey for pole position (if only there were music), or locking down a coveted doorway spot (for your leaning pleasure)? Fellas I am not saying that you cannot retaliate against some elbowy, jabby, pushy, space-eating chick, but come on! I am not saying that you have to lay out a red carpet or let hordes of ladies pass you by, but try to be civil and be gentlemen. Is every female a lady, no but why don’t you be a real man and show strength in being a gentleman? Don’t like that do you? Well, I don’t like it that about 90% of the time, pregnant women are offered a seat by other women, even blue-haired ones. When that fated day comes, when Husband and I have children, you better believe I am going to be giving the *eye* to seated able-bodied men that try to avoid my eye or those that are giving me a defiant-ya-well-you-wanted-equality-plus-you-having-a-bun-in-the-oven-is-on-you-not-me-so-why-do-I-have-to-give-up-my-seat look. Ya, you know the one. Honestly, it’s just the right thing to do. If someone has a cane, crutches, severe limp, is pregnant, or uber old…you give them a seat. Plus, when you, manly men, give up a seat, your stock just raised in the eyes of most of your fellow commuters. C’mon guys, isn’t the prospect of laying foundation with other ladies a good outcome besides being decent, chivalrous, and outshining the other barbaric men around you? I will say this, there may be a sliver-sized group of people, mainly men, who routinely offer up their seat and are turned down. Please do not get lazy on us, we treasure you. Is uttering a few words or gesturing to your seat really going to ruin the email you’re composing, wreck the song you are listening to, or mess up the rhythm of your morning? I sure hope not. *When walking down the street, walk on the side of the woman, which is closest to the street, to block her from being possibly hit by a car or any other potential danger. *Sit facing the entrance/exit, in order to see any possible danger to protect your female company. *Enter into a revolving door before your lady, so you do the pushing and she doesn’t have to. *Hold the car door open for your woman and let her enter a cab or any rear of the vehicle first. *Let a woman sit in the passenger seat, if someone else is driving, and you take the backseat. (I love this one, it just tickles me for some reason). Husband will put up his hands like he has two six-shooters and will make sounds like he’s shooting them any time I chivalry-block him. For instance, when he tries to walk on different sides of me, trying to do the street-side protection, I don’t let him. It’s my OCD-ness that is the true culprit though. I guess I am responsible because I maintain it. I have to walk on the right side of Husband. He gets it the worst because he knows me best and loves me with all the craziness stirred in there. Thus, he allows this to persist or maybe, it’s just not worth struggling against. I do not subject new people to this and it doesn’t apply in groups, since I am usually on someone’s right. A lot of people don’t even notice that I usually position myself to their right, which works for me (don’t want to show all my crazy). Overall, it tickles me when my husband does some of these things for me. There are some things that I expect like holding doors. I particularly like it when he protectively puts his hand on the middle of my back. This gesture can also be seen as reassuring, he’s just checking on me in a physical way. I am also a big fan of when he puts out his hand for me when I am getting up from a seat on the train. It just makes me feel special. Take a small portion of that feeling and think how far that could go on your morning commute and how that positivity could have a domino effect on how you treat others, which will then affect others. Take the “be kind rewind” slogan and apply that to people. Be kind or at least decent and somewhat considerate and the payoff could be great for all involved. It is very simple. 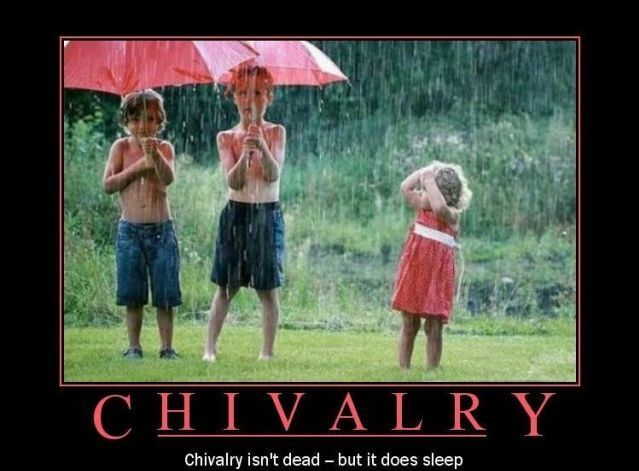 As for chivalry, if you want to keep it alive: nurture it, appreciate it, and lend it a small helping hand. As I write this, I am not sure that chivalry has to be stopped before it goes quietly into the night and finds its final resting place, because I may just deign to fight for kindness and consideration in its stead. No gender distinction required. What a novel idea. What a world it could be…what a commute! 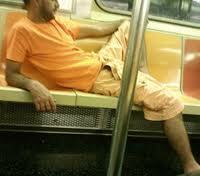 Do be considerate of others, but particularly those that need a seat more than you. Do not be a doorman, chauffeur, doormat, or wuss when it comes to being polite to others. Do not shoulder-check lades unless provoked. Do not give the stone-cold stare or glare when a chivalrous act is attempted or completed, try a smile please. This entry was posted in Subway Series and tagged Chivalry, Etiquette, Manners, Subway. I can recommend 2 great books about how we got here. “Letters to a Young Progressive: How to Avoid Wasting Your Life Protesting Things You Don’t Understand” by	Adams, Mike S.
Finally, only believe in the one true Jesus Christ can save us. He was not a racist. He understood that women and men compliment and complete each other and should not compete. His “select” are those who follow HIM , period.